Not long ago I was contacted by musician Santiago Arteaga who has been working for several years on “the design of an ergonomically enhanced bass guitar” – a project that began as his degree thesis in industrial design at the Universidad Nacional in Bogota, Colombia. Now having lived six years in Barcelona, Spain as a musician, Santiago has completed a new prototype five string fretless bass. The first step was an analysis of the electric bass guitar over the last half century. Much of his research was done over the internet which helped to offset the difficulties of obtaining instruments to examine. A series of interviews were made with many bass players from the area, asking them about their playing-related illnesses, their choice of basses, and their opinion about these basses in a series of categories that were selected for them, as well as photographic and video recordings of every one. Fast forward to several months ago when Santiago returned to Colombia for a 1 month trip and began work on prototype bass #2 – the result of working with Bogota luthier Andres Barrera who made the neck according to Santiago’s plans while Santiago focused on the bass body. A metal working shop built the bridge and tuners from Santiago’s plans. 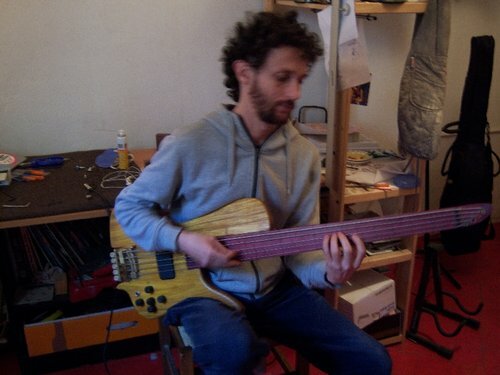 Upon returning to Barcelona, the bass was assembled and completed within a month. This was back in November so the instrument has been played for three months now. So what about prototype #1? Unfortunately, it was stolen after having been played for about 2 years. Santiago then focused on playing his G & L bass which also ended up stolen! Fortunately, this inspired him to return to his research and build #2. Although hard to make out in the very first image, the full access neck is mounted with a 10 degree downward rotation – a feature that reduces wrist flexion in the fretting hand. 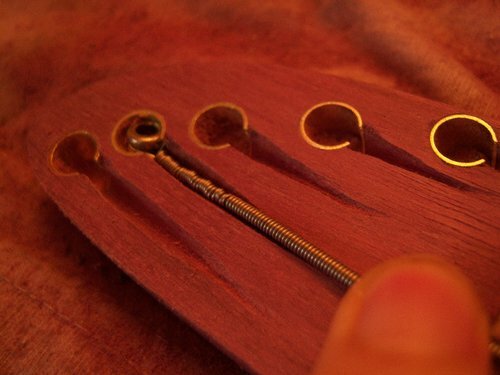 We’ve seen the concern over excessive wrist flexion addressed by luthier Jerome Little. A great example is Xavier Padilla’s Torzal Neck Bass Guitar. But unlike the complexity of twisting a neck throughout its length, Santiago’s solution is exciting for the ease with which an amateur builder can experiment with it in a design of his or her own. Santiago also designed his own tuning solution – a solid brass five string bridge and tuners system. Woods include canarywood for the body and purpleheart for the neck. So far, in general, I like it a lot. I find that with this bass I can play things that I couldn’t play on the G & L especially in the upper register. I also find that I get less tired from carrying the bass around and doing long rehearsals and gigs. Standing up, it balances great but sitting down it’s a bit body heavy due to the massive bass bridge. 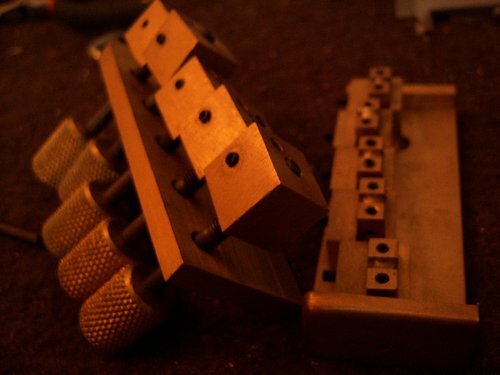 Though I like the sustain that the brass bridge provides, a lighter aluminum prototype will be in the works or perhaps another model with reduced mass. With such an interesting second bass guitar behind him, I suspect we’ll be seeing more of Santiago Arteaga’s ideas take shape in future instruments builds. Bien hecho, Santiago! Many thanks to musician Santiago Arteaga for sharing his vision with Building the Ergonomic Guitar. Looks very interesting and from your article here I would sure like to try it, even I can’t play fretless instruments. Late night editing error! 🙂 What I meant to say was that it was equivalent to a 24 fret neck or a two octave range. Thanks for the catch! I thought so as well. Again, I have to thank Santi for sharing his build with us. When he’s playing – from the picture at least – he seems to have his picking/plucking hand above the fretboard (I know, I know it’s fretless!) all of the time. I would like to have the sound from picking near or close to the pickup. I wonder how much you have to retract your elbow and arm and if it can rest still, on the body. I think I do want a more curve on the body, the back could be arched more to the human torso, just as the Klein KX-bass. Which reminds me of one thing, I should’ve presented that one as well, around here, ages ago. 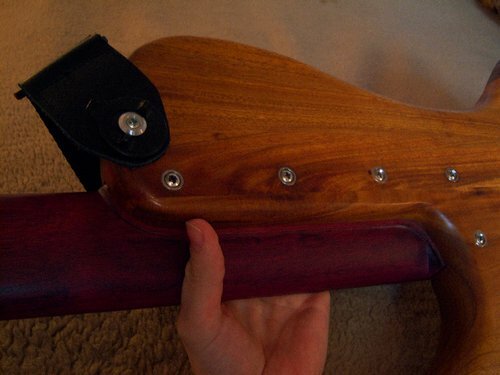 Funny “headstock” solution though. Especially string guides. Headstock does have impact on sound, sustain as well as balance. Well done and well thought out! I vary the arm position from one like the one in the first picture (for a warmer sound) to a position very close to the bridge, for which the shoulder muscle group lifts the arm. In this position the body still supports about half of my arm, still preventing the picking wrist from bending. Right now iÂ´m working on a more back arched bass, which is very useful, and is quite standard. I have never seen the klein KX bass. Do you have any pictures? Yes, I have promised to publish pictures of my Klein KX-bass replica around here for quite a while now. It seems one can’t do this without personally mailing the administrator. I will e-mail Robert now, with pictures. provided that you are a member of the Klein Electric group. Mats – Message received! I’ll work on getting an article together ASAP. So you know, I’ve been giving a lot of thought to the challenges presented by the site’s current format in terms of interaction and posting of material. There are a few ways to proceed here each presenting its own challenges but I’m hoping to expand our community’s ability to interact and exchange information. 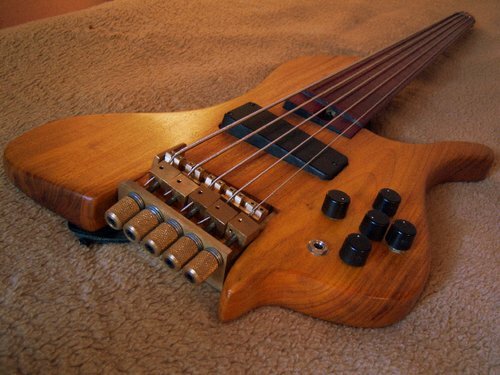 Intriguing rendition of a fretless bass. Nice instrument! Nice feature with the hole for the string offset from the center axis of the plungers (or whatever you call the moving parts that the strings attach to) of the tuners. It allows the plungers to be way shorter since the threaded rod can go all the way through it. Also, is the research you conducted formulated somewhere? It could be interesting to read the considerations on ergonomics, antrhopometrics, vibration, etc. Funny, I was thinking that the offset attachment looks like it introduces some odd torque on the blocks. I was trying to imagine them skinnier, so the string hole could still be centered along the line of pull, and taller, so the adjustment screw could go under the string hole. The general rule of thumb for guitars is 1/2″ of string take-up. It seems you’ve been very unfortunate getting both your G&L and first prototype bass stolen. Take more care, and guard it. answer this post and iÂ´ll send you some pictures of my first bridge prototype. perhaps youÂ´ll find them interesting. I was trying to eliminate the torque that ray de gennaro mentions, but i ended up gonig with it. the “plungers” as you call them or “string retainers” as i do have about 15 mm of travel. Ray, I see your point regarding torque. Having the string hole below the screw would give vertical torque instead, but that might be easier to manage depending on the design of the grooves in which the plungers move. Thanks, both of you, for the travel estimates (1/2″ is 12.5 mm, so you confirm one another). Santi, yes please, I’d like to see the pictures. My email address is agoest at gmail dot com. So, is the torque mentioned by Ray a problem after all? I have found something very interesting here. I must try it after reading this article. A mi no me molesta mi pana! Muchas gracias por el comentario. Ya ves que aquÃ­ hay toda una comunidad de curiosos. Me encantarÃ­a conocer tu trabajo. Donde lo puedo ver?